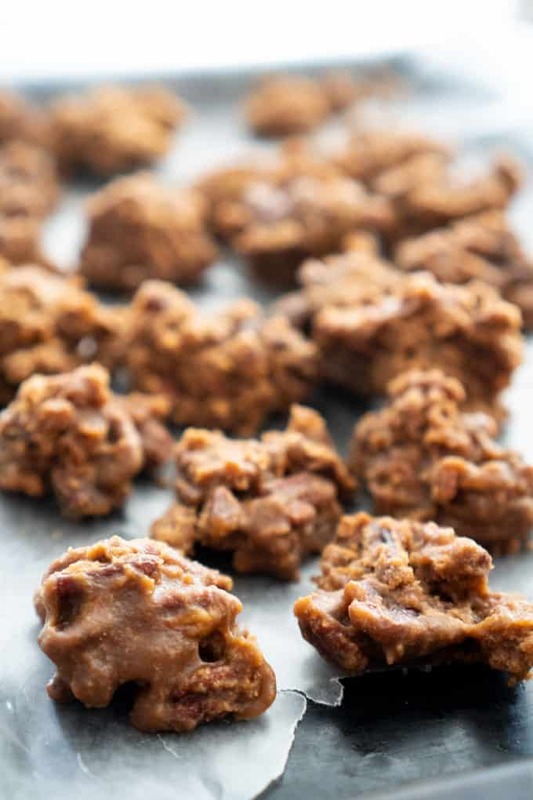 It’s easy to make homemade pralines, even without a candy thermometer! 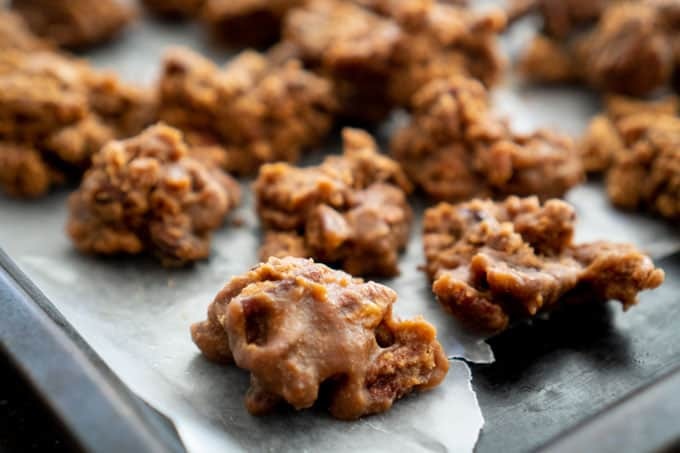 Make this Microwave Praline Recipe in just 15 minutes! When I lived down in Charleston, SC I would love walking around the cobblestone streets of the market taking in the sights, sounds, and smells of my favorite city. From the beautiful sweetgrass baskets to the clip-clop of horses toting tourists on carriage tours, I can almost take myself back there if I close my eyes! If we were lucky as we walked down Market Street they would have samples of pralines to try outside the candy shops…sweet, melt in your mouth pralines are one of my favorite treats and perfect for holiday gift giving! Today I’m going to share with you the easiest way to make pralines-no candy thermometers here, just perfect pralines in 15 minutes! 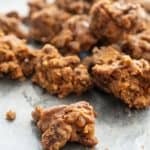 I hope you love this easy microwave praline recipe! *This post was originally published in November of 2013 and was updated with new pictures and additional instructions December 2018. Use a larger bowl than you think, the mixture bubbles up a lot in the microwave and you don’t want it to spill and create a mess in the microwave. Times listed below are for a 1000 watt microwave, which is what I had when I first published this post in 2013. In my current 1200 watt microwave, I use 4 minutes for the first time, stir, then 2 minutes, stir, and a final two minutes before letting it rest in the microwave for one minute. The mixture will thicken quickly as you stir after removing from the microwave. When the texture changes from shiny to more powdery you need to put the spoonfuls on the prepared sheet quickly. 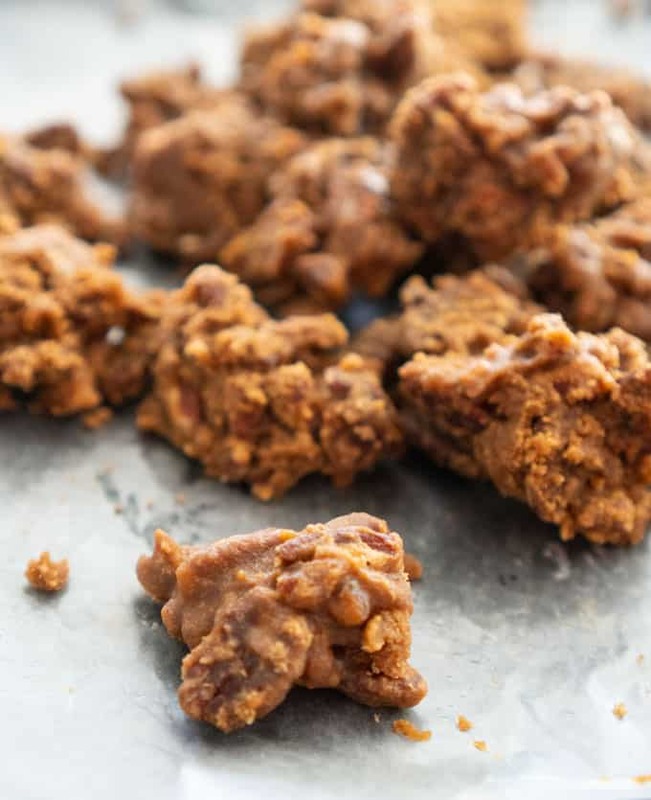 It’s easy to make homemade pralines, even without a candy thermometer! Make these Microwave Pralines in just 15 minutes! Prepare a baking sheet by lining with parchment paper and greasing with butter. Mix all ingredients in a large microwave-safe bowl. Let sit in microwave one minute. Remove from microwave, mixture will be bubbling. Stir for 3-4 minutes until thickened. Spoon by teaspoonfuls onto buttered parchment paper and allow to cool. I mentioned in the recipe but want to reiterate, this is not a recipe to pop in the microwave and walk away from. Doing so could lead to burnt candy which is no fun. Microwaves vary a lot and you need to keep an eye on it to make sure it doesn’t overheat and burn. But that’s about the most labor intensive part of this recipe! Do you love pralines? Have you tried this microwave version before? Totally craving these now at 6:30 in the morning! I think I will try these this weekend. I’m so happy to hear that Beth-they were so much easier than the traditional method for me and my family LOVED them! to going over your web page again. Very few recipes find themselves onto my “love and make over and over” list, but these are the BEST! No fail and delicious each time!! I’m so glad Lizzie-I love them too, I like to make them as gifts around Christmas especially! Thanks for taking the time to let me know what you thought! I used double cupcake liners in muffin tins to pour them into. I also used evaporated milk since I had a couple of cans that I wanted to use. ( I still have one can left. ).I waited for them to cool and then put in plastic containers to store. I also made them with evaporated milk and they came out looking and tasting just fine.The calorie count was 2926 for the Evaporated Milk .364 calories less and less fat also.